Next to the story about the Disobedience of Adam and Eve is the story of Cain and Abel found in Genesis 4:1-12. Cain is the firstborn son of Adam and Eve. He grew up to be a farmer. Later, Cain had a brother named Abel and he grew up to be a shepherd. Then came the time when both Cain and Abel brought an offering to the Lord. Cain brought some of the fruits of his harvest while Abel brought the best of his sheep. God was pleased with Abel's offering but not with Cain's. Because of this, Cain became very angry and jealous and sad. God told Cain that if he had done what is right, he will be accepted. But Cain did not listen. He called Abel and they went to a field and there Cain killed his brother Abel. When God asked Cain where is his brother Abel, he said he did not know. But God knows that he killed his brother, so He punished Cain. When Cain tills the ground, it will no longer yield fruit and he is to become a wanderer all his life. Ask the kids questions to review the story to know if they understood the lesson. 1. Who are the sons of Adam and Eve? What do they do? 2. When offering to God, what did Cain and Abel give? 4. Can we hide anything from God? So, if we lie does God know it? (When Cain sinned he should have asked forgiveness for his sins and God will forgive him. In the same way, when we do something that is not right, we must ask for God's forgiveness and He will forgive us). Cain and Abel coloring pages. You can also make out of these your visual aids for telling the story. 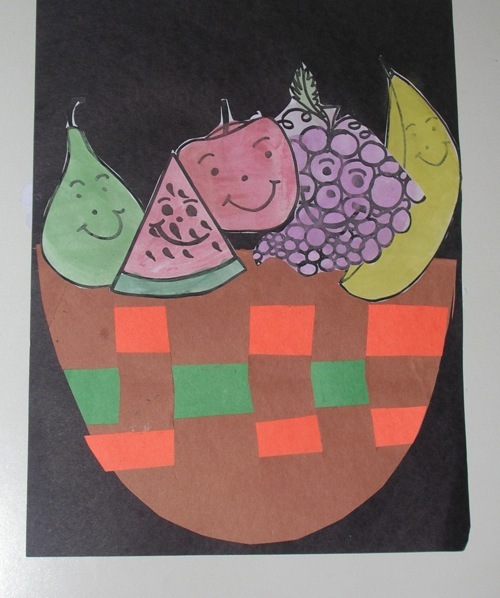 To remember what Cain does for a living, make this basket of fruits as an art activity for the kids. Just follow the directions for making a basket from the preschool for all page. For the fruits to be colored and pasted on the baskets, just draw some fruits or find some free fruit coloring pages online.